Back in 1942-43 over 15,000 Marines were stationed in three camps north of Paekakariki. They were here to train for the Pacific war against Japan, and, if necessary, defend New Zealand from invasion. On Sunday and Monday, this crucial time in the history of the Kapiti Coast and the nation will be remembered. The In the Footsteps of the Marines event on Sunday 27 May goes through territory where the young Americans trained. 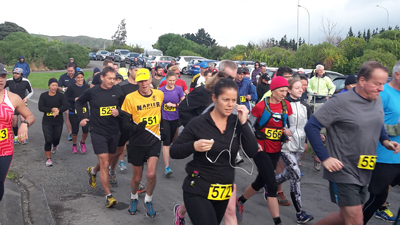 If you have a reasonable level of fitness and can walk or run for an hour and a half, you’ll do it comfortably and be raising money for good Kapiti causes. The two courses (11.5km and 9.5km), cover a variety of terrain including unsealed roads, clay, grass and bush tracks. Unlike in previous years, the event does not include any public roads. Entries are also accepted on the day for $30. Registration opens at 8.15am on Sunday morning at the Whareroa Farm Shelter. Race walkers, social walkers and slow joggers start at 9.30am and runners at 10.00am. The event is sponsored by The Print Room, Cityfitness and Pak’nSave. Money is being raised for various local groups such as Whareroa Guardians, Raumati Scouts and the Kapiti US Marines Trust, however, the major recipients will be Kapiti Women’s Refuge and Kapiti Life Flight Trust.